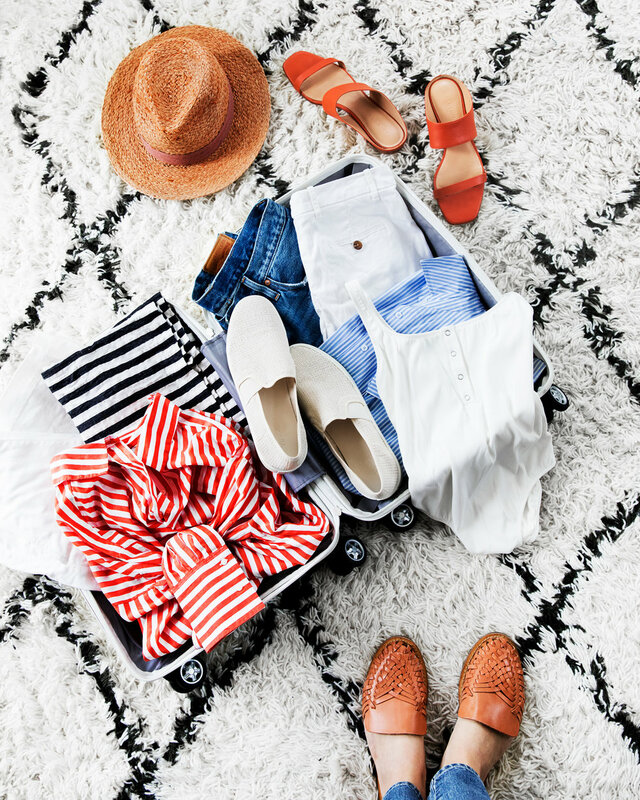 an east coast girl packs for a west coast getaway! 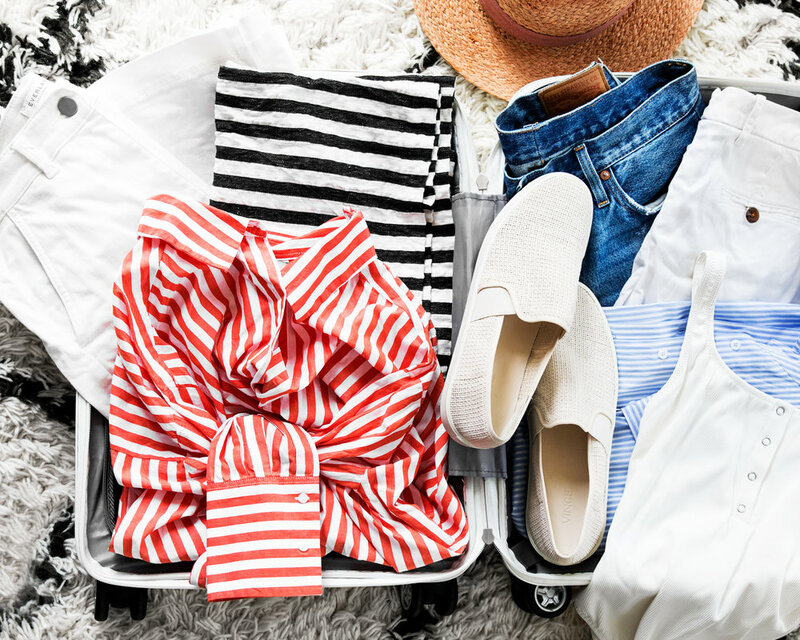 Have you read about those different "packing hacks" I've seen lots of posts about lately? like one easy way to alleviate packing stress is to stick to a single color scheme? I love the idea, but this is not one of those posts... as I've tried it a few times with *near* but not perfect success. The problem is, I think the fun part for me about packing for a trip is I'm usually breaking out stuff I'm not wearing during my day to day, which rarely is all one color. Although, there is a bit of theme for my suitcase this time around. I unsurprisingly! 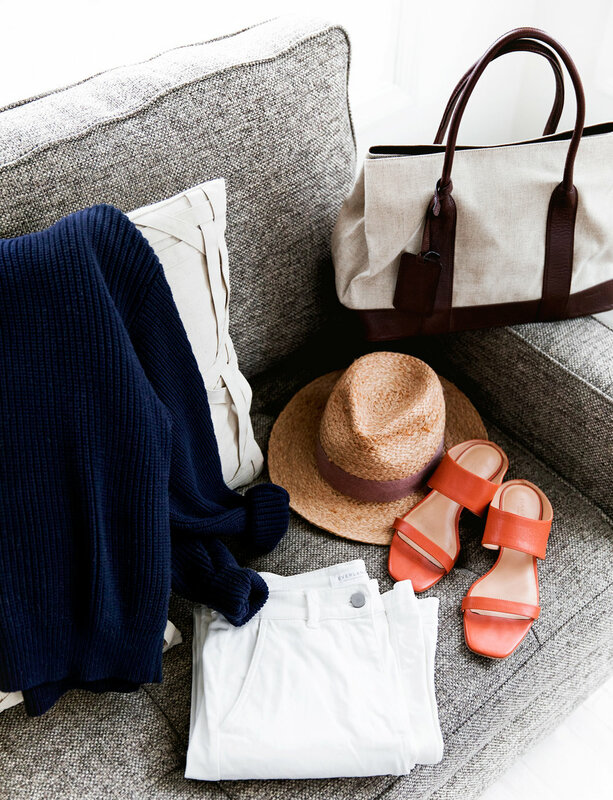 stuck to packing whites, stripes, and denim. In a couple of days we're heading to Palm Springs for a quick vacation before we both have photoshoots in LA the following week. It's rare we can squeeze something like this in when our schedules are busy, so we're planning to take full advantage of the time together. So what are the things that always manage to sneak into my suitcase when I'm heading someplace warm? 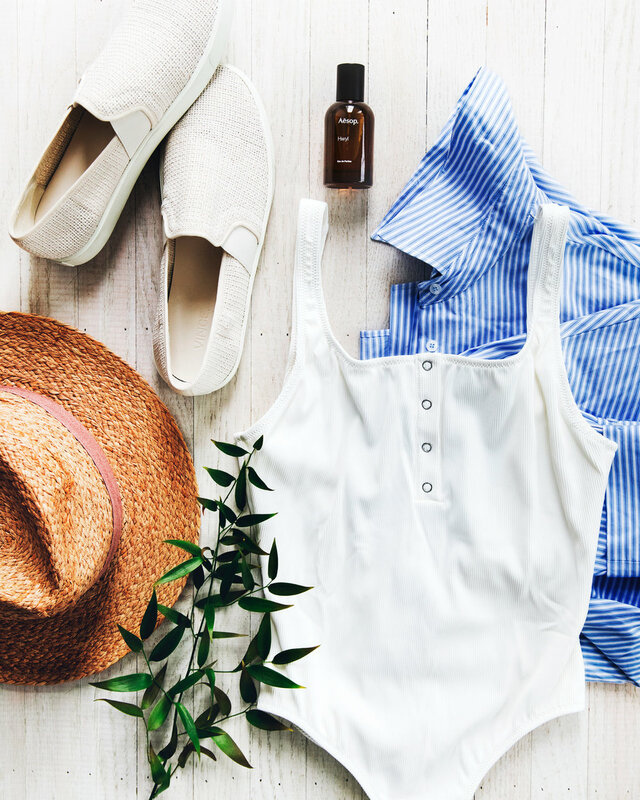 White sneakers, a straw hat, oversized button downs, a classic sweater, and a great one piece swimsuit. I recently scored a deal on the Solid & Striped swimsuit below, a brand I've been meaning to try for a while and hadn't quite had the right excuse yet. I'm such a sucker for a one piece suit and immediately fell in love with the ribbed white "Veronica" style. I'm thrilled with the fit and quality of this one. My tried and true crew neck sweater from Aritzia is a magnet for Daisy hair, but worth the lint rolling hassle because it is definitely the most trusty sweater I own. It always travels with me, regardless of season, and since it won't be crazy hot while we're on the west coast, layering ability is key. The other must-have on my packing list is fragrance. I swap different ones in and out of rotation, or layer different scents pretty regularly. Currently on rotation is a new favorite, Hwyl from Aesop. Unsurprisingly, Robert keeps stealing it from me because it smells super woodsy, smoky and all around masculine. We're actually very good at sharing in that department. Below are links to these pieces pictured or similar ones, for your next warm weather trip or to just anxiously squirrel away for your summertime wardrobe.